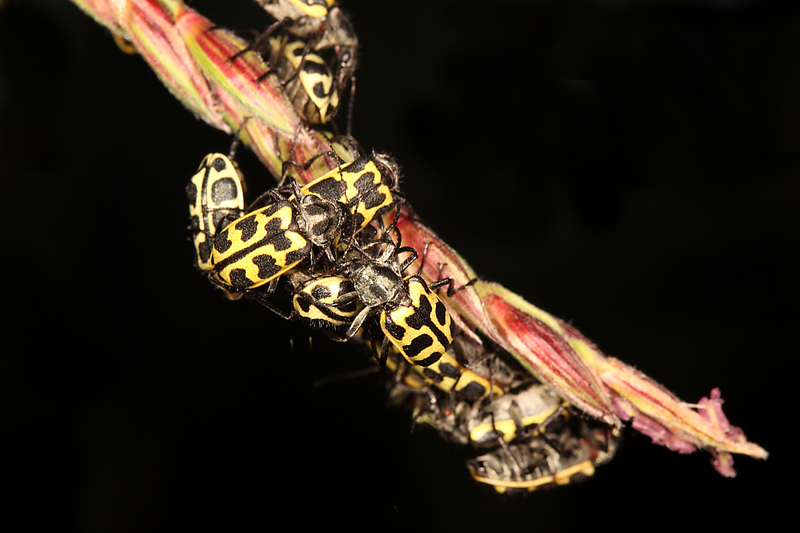 Astylus atromaculatus (spotted maize beetle) | Inés Indart, Argentina. 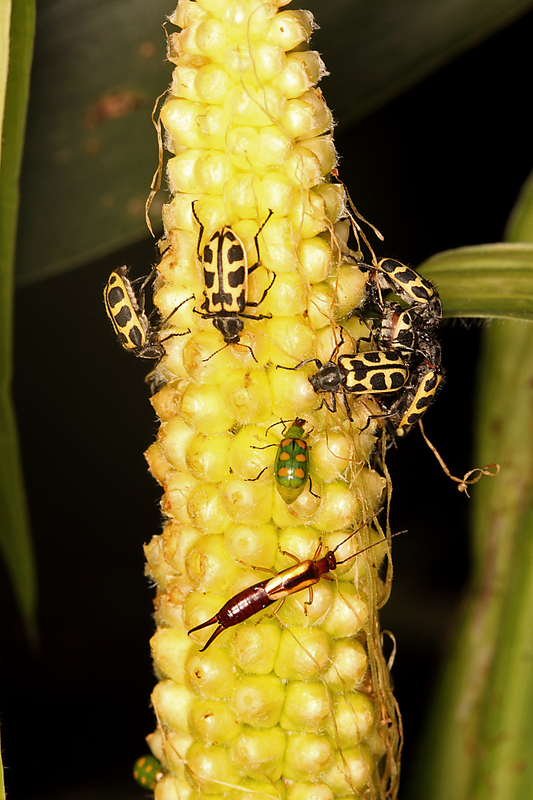 One of the most common insects encountered in agricultural fields in Argentina is Asylus atromaculatus (spotted maize beetle). This native species can also be found further north in Bolivia and Brazil, and as implied by its common name it is frequently encountered in maize fields. The species, however, is also common on soybean, on which the individual in the above photo (and mating pair in the previous post) were found. 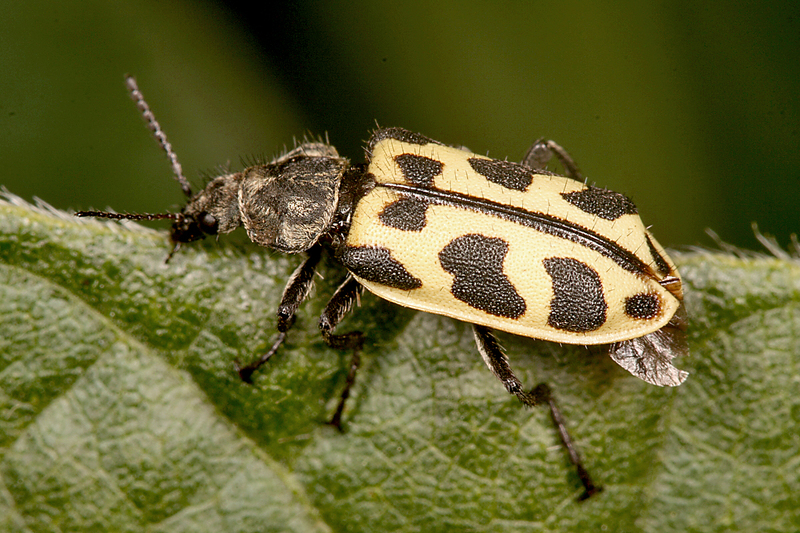 Looking like some strange cross between a checkered beetle (family Cleridae) and a blister beetle (family Meloidae), it is actually a member of the Melyridae (soft-wing flower beetles)—placed with the Cleridae in the superfamily Clerioidea. Despite its abundance (and the resultant attention it gets from growers), the pollen feeding adults are of little economic importance. 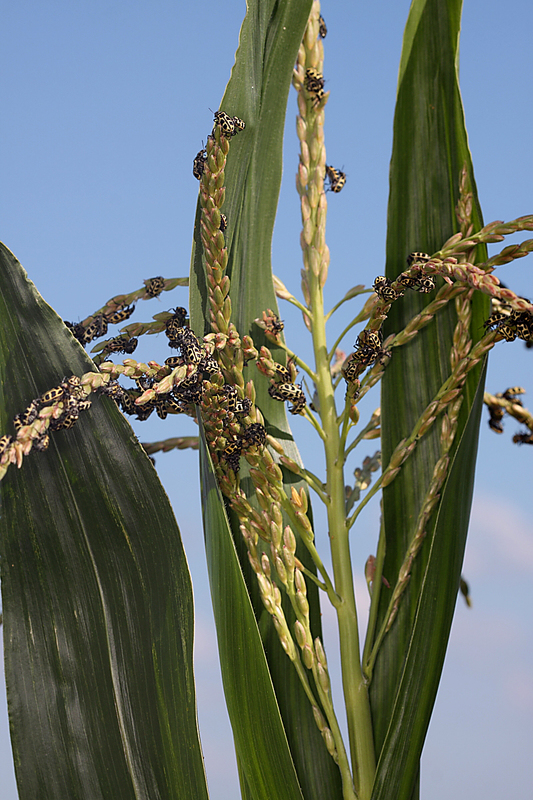 It’s easy to see, however, why this species gets so much attention from growers—during January through March the adults occur in tremendous numbers, congregating on a wide variety of flowering plants, but especially corn. Their large numbers are an impressive sight, with literally dozens to even hundreds of adults occurring on a single plant. Tassles—the source of corn pollen—are highly preferred, but when populations are heavy the silks and any exposed ears are also popular congregation sites. 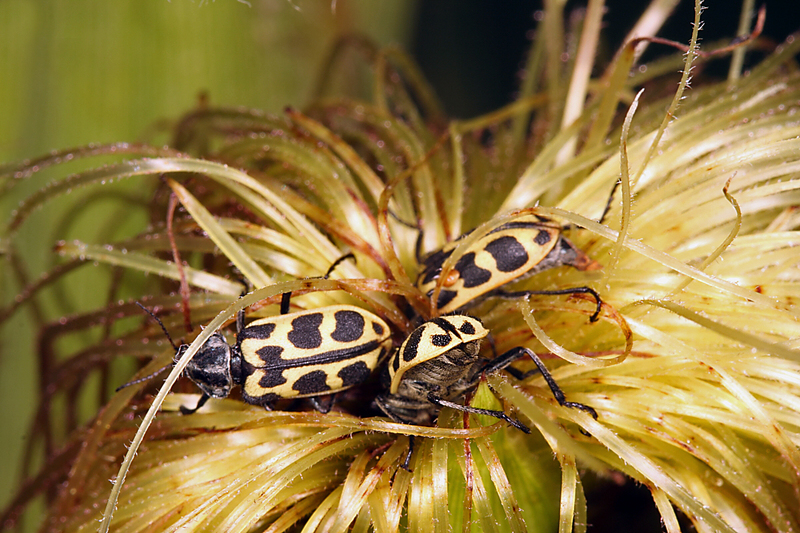 Despite their numbers, the impact of the beetles on yield is rarely sufficient to warrant the cost of control measures. Whatever economic impact the species might have is actually due more the larvae—hidden within soil—than to the super-abundant and highly conspicuous adults. Feeding primarily on decaying plant matter within the soil, larvae do occasionally attack newly planted corn, either before or just after germination. Their attacks are more common in dry years and in severe cases can lead to the need to replant a field. This seems to be more common in South Africa, where the species was introduced in the early 1900s, than in its native distribution in South America. Whenever I see a ubiquitous, diurnal, brightly and contrastingly colored insect, the first suspicion that comes to my mind is aposematic (warning) coloration and chemical defense against predation. There seems to have been some investigation into the toxicity of this species (Kellerman et al. 1972), and in South Africa they have been implicated in poisoning of livestock when accidentally ingested with forage (Bellamy 1985). Few other reports of toxicity by beetles in this family are known, but four species of the genus Choresine have been shown to produce high levels of batrachotoxin alkaloids—these are the same toxins found in the skin of poison-dart frogs of the genus Phyllobates (Dumbacher 2004). The frogs are unable to synthesize these toxins themselves, thus, it is presumed that they sequester these compounds from their diet—whether it is from some species of Melyridae remains to be determined. Congratulations to Alex Wild and Max Barclay, who both answered the call to ID Challenge #8 and correctly determined all taxa from order to species. Alex, by way of submitting his ID first, gets a bonus point and leads the current BitB Challenge session with 9 points. Thanks to the rest who played along as well—see my response to your comments for your points earnings. This entry was posted in Coleoptera and tagged Argentina, beetles, entomology, insects, nature, predator avoidance, science, warning coloration. Bookmark the permalink. Interesting. I’ve always assumed the local common melyrid, the Scarlet Malachite, must at least taste bad. The only larva I’ve seen looked like a predator (or at least carabid like), but if the larvae are detritivores as with your maize beetle, then they may be eating a few litter ants and oribatid mites – known sources of many of the toxic alkaloids found in several genera of poison dart frogs – and passing along the toxins to the adults. I think larvae in the subfamily that includes the scarlet malachite are predaceous, so orbatid mites and myrmicine ants could certainly be a source of toxins for them to sequester. I wasn’t really trying to suggest that the spotted maize beetle in particular was an important dietary component for poison dart frogs – just that perhaps some other species of melyrids might contribute to the pool of suitable prey items. Thanks for the paper citation, although I couldn’t find it. I did find this more recent paper on the subject during my search. We had someone talk about poison-dart frogs at out little local molecular ecology meeting a couple of years ago – but all I remember is a lot of photos of pretty frogs and pretty forests, no beetles! Cool – I never actually knew what all this DOI stuff was. Sadly, Heterocycles has a “pay-per-view” service for non-subscribers – I can’t wait for universal open access! I wonder how to differentiate A. atromaculatus from A. variegatus. I’m unable to determine how these two species are distinguished. 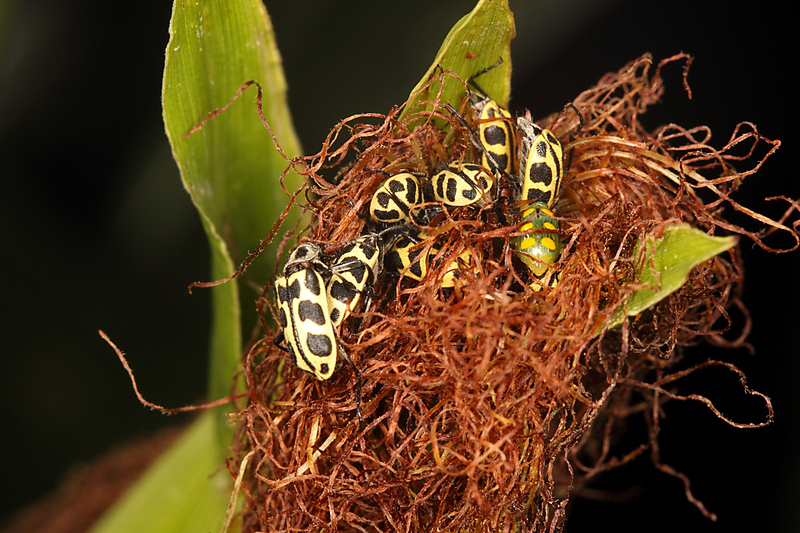 Astylus atromaculatus seems to be mentioned primarily as an economic pest in Argentina, while A. variegatus is mentioned mostly in the Brazilian literature. I wonder if they are actually the same species. Thanx, Ted. I thought about it, but I see them both together mentioned in some files. For example, Coleoptera Neotropcial has them both listed to Argentina, and I searched a lot, but did not find any source mentioning they’re synonymous.